Roachclip's debut album (Till Morning Light) is from 1990 and their second disc (The Return) was released 2009, so this is only the third piece of art from these gentlemen. 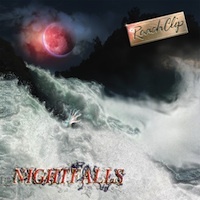 'Night Falls' is full of beautiful melodic rock tunes with a mature touch to it. The style is close to AOR, but it contains several stiffer rock songs and they really have used the time to make a very good production with many songs that have character and personality. The multi-artist Sven Bauer as the vocalist is a perfect front man for the band and his voice gives Roachclip their own and unique sound. Let's pick some of the tracks. Intro song 'No Reason' is a classic catchy hard rock song with nice melodies and fancy choirs. Slow and sensitive is my reflection to 'Buffalo', which is a power ballad with a great guitar solo from Rolf Schmidt. Third track is in French - 'Le Bon Roi Dagobert', which means 'The Good King Dagobert' and is a funny and cool song. Nice with something that is different from the regular formula. In the slow, mega heavy song in some kind of Maiden ballad tempo 'GL 298' craws forward in a leisurely and powerful pace with awesome guitars exploding in the middle. Strong track! 'It Is You' is a timeless tune that is hard to get a grip abound and is one of the weaker songs on the album. 'Poison Blond' turns everything around and is a metal track with crushing melodies and it's powerful. '1077' was first a 'skip' track for me, but after the 5th listening the coin did fall through and the glorious guitars in the background is worth a special mention. Next track is a classic straight forward rock song in almost punk tempo?! Oops, the following track 'St. James Infirmary' is a super calm bluesy ballad with a female vocalist, so I had to check if I were still listening to 'Night Falls'! It turn significantly between the genres on this album. The ending tracks are also strong songs with an exceptional production and the total score is high, much higher than I first felt after the first spin. This is an album that grows with each listening. A nice acquaintance and a tip if you like hard rock in a modern and in a more adult direction.